This is one of two slot machines which have been developed as part of the Blood Lore series by NextGen Gaming that pits vampires against werewolves, with the other being the Blood Lore Wolf Pack slot machine that sees you take the role of a vampire. Here you take the role of a vicious werewolf with big wins on offer for every vampire that you sink your teeth into! This gory encounter first appeared at online casinos back in 2010, however they have both recently been released on mobile devices too. You’ll find yourself entering the vast mansion that the vampires call home, with eerie sounds ringing out to give you a spook, accompanied by a piano tune and random noises to add to the chilly atmosphere as they vampires try to halt you in your steps late at night. A black and white chequered floor with magnificent marble columns and lit torches will great you as you enter the vampire lair as the full moon appears to get your revenge for them sinking their teeth into fellow werewolves. Consisting of a 5x3 reel grid, with 20 paylines and a tasty return to player percentage of 95.43%, the stakes aren’t as frightening as you’d expect with a variety of coin options for you to choose from, enabling bets from a minimum of 0.4 up to a maximum of 80 to be made for those of you who aren’t easily spooked. Will You Escape the Vampire Mansion? You’ll be hoping to sink your teeth into as many blood thirsty vampire queens as possible as you explore their mansion, as seeing five of them approach you at once means wins of up to 5,000 coins, plus they are Wild with the ability to substitute for all symbols aside from the Scattered Moons (which can bring wins of up to 100x your stake) and double prizes in which they are part of winning combos. A bunch of pale vampires will also attempt to tackle you with an assortment of weapons such as guns and sprays, with gory Ace to 9 symbols also featuring. Vampires are said to be more active and bloodthirsty when a full moon appears, and the reels are certainly a hive of activity whenever you land three or more full moons (Scatter symbols) at the same time as you’ll enjoy large instant wins while triggering an adrenaline rushing free spins bonus game. Three, four and five full moons lighting up the reels at once will see you win 5x, 15x and 100x your stake respectively, however it’s the free spins feature that you’ll be most excited to sink your razor-sharp teeth into – it never fails to deliver savage wins! The number of free spins you are armed with will depend upon the number of Scatter symbols that you trigger the feature with, with three seeing you enjoy 12 free spins, four bringing you 16 free spins, and five resulting in the maximum of 20 free spins. In addition to this, all the winning combinations are tripled in value throughout, with those which feature the Vampire Queen being subject to a sensational 6x multiplier bonus, and it’s even possible to win additional free spins! Can Your Ticker Take It? Taking on blood thirsty vampires is certainly not for the faint hearted with your pulse certain to race as you come face to face with the heartless blood suckers, however if your ticker can handle the pressure you can opt to enter gamble mode to up the ante and get the blood rushing further. The gamble feature offers you two ways to increase your winnings – either by doubling them or quadrupling them. Doubling them simply sees you choose whether the playing card will be red or black while to quadruple them the odds will be against you as you must choose whether the card will be a heart, diamond, spade or club. Be careful not to get too cocky though or you could find your winnings disappear as quickly as a civilian’s soul when a vampire sinks their teeth into their neck! Taking the role of a werewolf to battle against the bloodthirsty vampires might sound very scary, however you’re certain to have a bloody good time thanks to the eerie soundtrack, the dramatic vampire home that the slot is set in, and the sensational free spins feature which guarantees you will be well rewarded for your bravery. 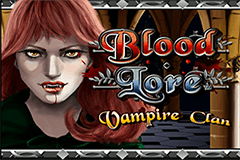 If you enjoy Blood Lore Vampire Clan and don’t feel to spooked out you should also sink your teeth into the Dracula slot machine from Net Entertainment which is a licensed slot that features far superior graphics and even more bonus features!